Last night, my husband and I flew back to LAX, and my wonderful mother was kind enough to pick us up. We were hungry after the flight, so we headed to our favorite restaurant that's close to LAX and open 24/7...The Kettle in Manhattan Beach. There are a couple different metered parking lots around the block, but last night we actually found free street parking. The Kettle is always hopping. Even at 10:30pm, we had to wait for a table. My husband and I have our "usual" which we starting ordering years ago when we were dating and he lived near LAX. We love the soup and salad combo, and we always choose a bowl of Chicken Tortilla Soup, the Grilled Chicken Cobb Salad with Cilantro Buttermilk Ranch dressing on the side and the Carrot Raisin Muffin. 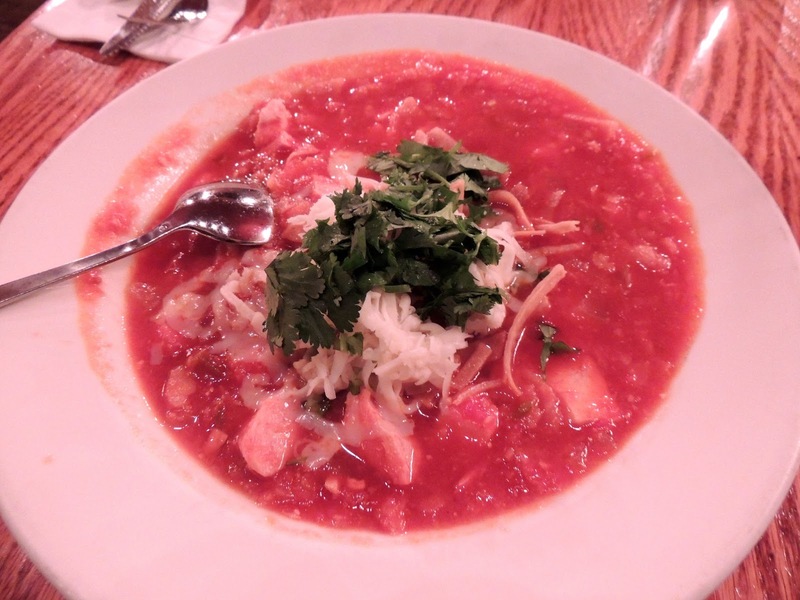 I love tomato-based soups, and it doesn't hurt that this one is topped with cheese and cilantro. It's a generous serving, and there have been times when, after eating just the soup, I have to ask for a box for the salad and muffin. 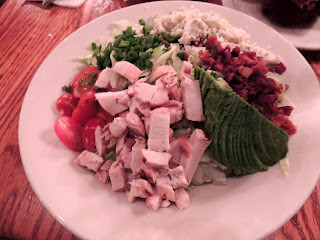 The salad has bleu cheese, scallions, chicken, tomatoes, bacon and avocado. I always give my avocado to my husband. The cilantro buttermilk ranch dressing complements the salad perfectly. 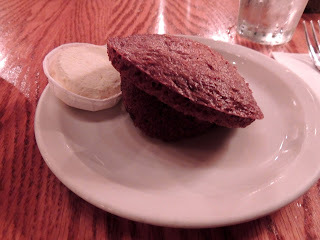 The muffin is probably my favorite part. I don't like raw carrots, but I do love these carrot-raisin muffins. They taste like cake. They have to have molasses in them. They're spicy with shredded carrots, whole raisins and walnuts. Yum! 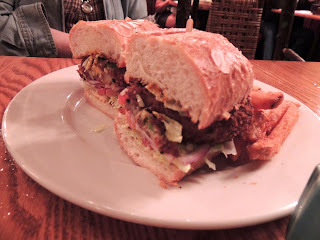 My mom doesn't have a usual and decided to order the Crab Cake Po' Boy. It was a huge sandwich with two big crab cakes on the bun. The fries that it came with tasted like something you'd get at a fair, which in my opinion is a good thing. We admired the meals on other people's tables as well. The cheese fries looked delicious, and there was a fried chicken dinner that looked so good we asked our waitress what the people at that table ordered so that we would know for next time. In reality, next time we'll probably stick to our usual. We don't make it down to The Kettle as often as we'd like, but if we lived closer, we'd probably try everything on the menu. If you live nearby or if you need somewhere to stop to eat after your long flight to LAX, you won't be disappointed at The Kettle.